Connor Handley-Collins, of TruVision VR, recently won the Breakthrough Award at the South West Insider 42 under 42 Business Awards evening. 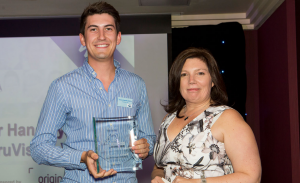 Connor Handley-Collins, CEO of FZ client TruVision VR, recently attended the South West Insider 42 under 42 Business Awards evening, where he won their Breakthrough Award. After his inclusion in the recent South West Business Insider’s Best 42 under 42 entrepreneurs in the south west, Connor wasn’t expecting to receive an individual award, so it was quite a shock when he was awarded the Breakthrough Award for the year. Connor has said that he is “gobsmacked and speechless” to receive the award, having expected a relaxed evening of celebration without the spotlight being shone on him. It’s great to see TruVision continue to pick up awards, and we look forward to many more successes from both Connor and the team!